Background: As prescriptions for off-label pharmaceutical use and autonomous administration of over-the-counter nutraceuticals become mainstream, thorough assessments of these compounds are warranted. Objective: To determine the effects of gemfibrozil, rosiglitazone, metformin, taurine, and vitamin E on body composition, hepatic lipids, and metabolic hormone and blood metabolite concentrations in a healthy, outbred rat cohort. Methods: Male Sprague Dawley rats were fed a purified 10 kcal% from fat diet for 56 days and assigned to either the diet alone (control) group or the diet plus oral administration of gemfibrozil (34 mg/kg), metformin (500 mg/kg), rosiglitazone (3 mg/kg), taurine (520 mg/kg), or vitamin E (200 mg/kg) group. Results: Rosiglitazone administration resulted in a 56% increase in carcass adiposity, cautioning potential prescriptive off-label use. Taurine supplementation had no adverse effects on evaluated parameters. A modest but significant increase in liver triacylglycerol content was observed with vitamin E supplementation compared with control (Δ 17.2 g triacylglycerol/100 g liver lipid). Conclusion: The evaluated pharmaceuticals had effects in a healthy population similar to the reported effects in their target population, and the nutraceuticals had minimal effects on the measured physiological parameters. The original intent of the experiment described herein was to assess the preventative capabilities of commonly prescribed pharmaceuticals and popular candidate nutraceuticals on the development of nonalcoholic fatty liver disease in a diet-induced rodent model. The chosen diet failed to induce substantial liver lipid accumulation in the rodents, providing instead, a cohesive, healthy, outbred population in which the physiologic effects of the selected pharmaceuticals and nutraceuticals could be evaluated. Here, we describe the effects of the pharmaceuticals metformin (a biguanide), rosiglitazone (a thiazolidinedione), and gemfibrozil (a fibrate), and the nutraceuticals vitamin E and taurine on total body composition, hepatic lipid characteristics, metabolic hormones, and blood metabolites in a healthy cohort of adolescent, male Sprague Dawley rats. We hypothesized that the physiological effects of the pharmaceuticals would be consistent with previous human literature and that no adverse effects would be identified with excessive vitamin E or taurine supplementation. All animal procedures were approved by the Institutional Animal Care and Use Committee at Iowa State University, and the methods were refined to minimize animal pain and distress. Sixty-one, 3-month-old, male Sprague Dawley rats (327–336 g) from Harlan Laboratories (Hsd:SD; Indianapolis, IN, USA) were used in this study. Rats were acquired in three different blocks to accommodate housing and personnel limitations, one block of 12 rats, one block of 24 rats, and one block of 25 rats. The rats were individually housed in conventional caging: solid bottom, plastic, shoe-box cages with contact bedding and a wire top. Sections of polyvinyl chloride pipes were placed in the cage of each rat as environmental enrichment. Housing rooms were kept at a temperature of 21°C−23°C with an automatic 12 hour/ 12 hour light/dark cycle. Rats were habituated to the environment, routine husbandry, and handling for 1 week with free access to water and a standard rodent diet (2018, Teklad Diets, Madison, WI, USA). Rats’ health status and body weights were documented daily. The original objective of this study was to compare the efficacy of gemfibrozil, metformin, rosiglitazone, taurine, and vitamin E on the prevention of liver triacylglycerol accumulation induced by a choline-deficient diet. Choline-deficient diets have been documented to induce accumulation of triacylglycerols in the liver through impairment of very low-density lipoprotein synthesis and export.4 Thus, upon acclimation, rats were randomly assigned to either a 10 kcal% from fat diet or a 10 kcal% from fat, choline-deficient diet (D12450B or D05010401, respectively; Research Diets, Inc., New Brunswick, NJ, USA). 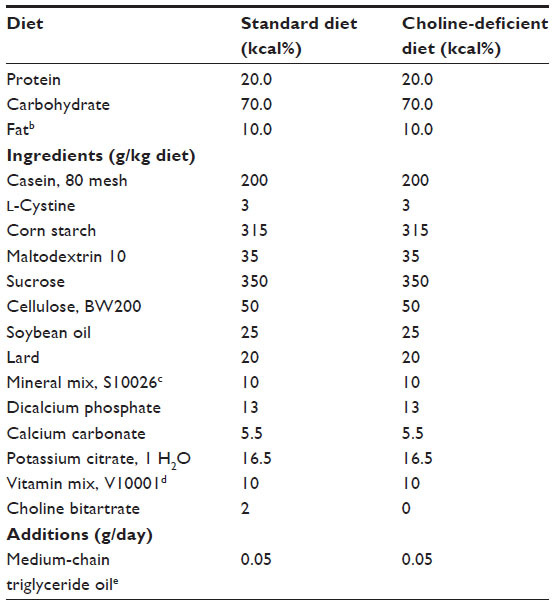 The only variation between the diets was choline content (Table S1). The choline-deficient diet did not cause the development of hepatic lipidosis (Table S2) or any other significant differences in physiologic outcomes, thus resulting in a singular dietary cohort (10 kcal% from fat diet) and a normal, healthy population for evaluation. All treatments were provided for 56 days, with dosages recalculated weekly on the basis of body weight and feed intake recorded daily. The daily treatment dosage was applied to several feed pellets for oral administration. Rats were given free access to the diets but denied access in the final 6 hours of the light cycle to encourage rapid consumption of the feed pellets upon which the pharmaceutical or nutraceutical dose was provided. Treated pellets were fed at the beginning of the dark cycle, and, once consumed, untreated pellets were provided for free access feeding. All doses were consumed by the rats. As gemfibrozil is lipid soluble, medium-chain triglyceride oil (SciFit, Tulsa, OK, USA) was used as the vehicle. Thus, all diets had additional medium-chain triglyceride oil added to balance for the lipid content of the gemfibrozil treatment. Blood samples were collected from each rat prior to the beginning of the dark cycle on days 0, 28, and 56 of the study. The day 0 and day 28 blood samples were collected from the lateral saphenous vein. The blood sample on day 56 of the study was collected perimortem via cardiocentesis under carbon dioxide anesthesia. All blood samples were stored on ice for no more than 1 hour before plasma (potassium ethylenediaminetetraacetic acid anticoagulant) and serum samples were centrifuged at 4°C at 3,000×g for 10 minutes and stored at −20°C until analysis. In all assays, samples from rats in multiple treatment groups were processed together to minimize confounding of interassay variability and treatment effects. Plasma insulin concentrations were measured using a commercially available rat insulin radioimmunoassay kit (SRI-13K, Linco Research, St Charles, MO, USA). The lower limit of detection was 0.1 ng/mL, and the reported intra-assay coefficient of variation was <5%. Plasma adiponectin concentrations were measured using a commercially available adiponectin radioimmunoassay kit (MADP-60HK, Linco Research). The lower limit of detection was 1 ng/mL, and the reported intra-assay coefficient of variation was <5%. Plasma samples also were analyzed for glucose concentrations by using a commercially available enzymatic kit (Pointe Scientific Inc., Canton, MI, USA). By utilizing commercially available enzymatic kits, serum samples were analyzed for total cholesterol and triacylglycerol concentrations (Pointe Scientific Inc.) and nonesterified fatty acid (NEFA) concentrations (NEFA-C kit, Wako Chemicals USA, Inc., Richmond, VA, USA). Choline or choline-by-treatment interactions were not significant for any measurements in this study when estimated as fixed effects in the models described in this section; therefore, rat assignment to a choline or choline-deficient diet was treated as a fixed blocking effect. Repeated measures analysis of variance (ANOVA) was used to test differences among timepoints for blood metabolites by using block, choline, treatment, timepoint, and treatment-by-timepoint as fixed effects and rats as subjects. Within-rat covariance across timepoints was modeled using an autoregressive covariance structure. The type I error rate of multiple comparisons within timepoints between treatments was corrected using simulated P-values with logical constraints.14 Multiple comparisons within treatments compared with day 0 were corrected using Dunnett’s adjustment separately from the between treatment corrections. Treatment effects on carcass and liver endpoint measurements were compared by ANOVA with choline, block, and treatment as fixed effects. Multiple comparisons were corrected as described earlier.14 Growth curves were modeled similar to the methods of Eskridge and Stevens.15 Briefly, cubic polynomials were fit for each rat’s weights over the 56 days and the intercept, linear, quadratic, and cubic parameter estimates were each compared by ANOVA with block, diet, and treatment as fixed effects. Multiple comparisons within coefficients were corrected as described earlier.14 A significance level of P<0.05 was used for all statistical tests. Data are expressed as means ± pooled standard errors of means (SEM). Statistics were calculated using SAS software, Version 9.3 of the SAS system for Windows (SAS Institute Inc., Cary, NC, USA). All measured body composition characteristics are summarized in Table 1. The average carcass weight for rats in the metformin treatment group was significantly lower than that of rats in the rosiglitazone (Δ=27.04 g, adjusted P=0.0006) and vitamin E treatment groups (Δ=22.57 g, adj P=0.0055), but not that of rats in the control group. The rosiglitazone treatment group had a significantly higher carcass dry matter (adj P≤0.0008 for all comparisons) and lipid percentage (adj P<0.0001 for all comparisons) than all other treatment groups. The rosiglitazone treatment group also had significantly lower carcass protein percentage than all other treatment groups except vitamin E (adj P=0.0643 for vitamin E; adj P≤0.04 for all other comparisons). Notes: Values are expressed as means ± pooled SEM; n=10 for all treatments except for control (n=11). Means in a row with superscripts without a common letter are significantly different (adjusted P<0.05) by ANOVA with choline, block, and treatment as fixed effects, correcting for muliple comparisons. Abbreviations: ANOVA, analysis of variance; SEM, standard error of mean. Liver lipid and triacylglycerol concentrations for each treatment group are also summarized in Table 1. Rats receiving metformin and rosiglitazone had significantly lower liver lipid percentages compared with rats receiving gemfibrozil (Δ=0.52 g lipid/100 g liver, adj P=0.0064; Δ=0.57 g lipid/100 g liver, adj P=0.0024, respectively) and vitamin E (Δ=0.46 g lipid/100 g liver, adj P=0.0188; Δ=0.51 g lipid/100 g liver, adj P=0.0075, respectively), but not those of the control rats. Liver lipid percentages in the gemfibrozil treatment group were significantly higher than those in the taurine group (Δ=0.43 g lipid/100 g liver, adj P=0.0310). Liver triacylglycerol concentrations for rats in the vitamin E treatment group were significantly higher than those for rats in the control (Δ=17.2 g triacylglycerol/100 g liver lipid, adj P=0.0098), gemfibrozil (Δ=14.5 g triacylglycerol/100 g liver lipid, adj P=0.049), metformin (Δ=21.2 g triacylglycerol/100 g liver lipid, adj P=0.0013), and rosiglitazone (Δ=21.8 g triacylglycerol/100 g liver lipid, adj P=0.0009) treatment groups. The treatment effects on plasma glucose and insulin concentrations are presented in Table 2 and Figure 1A, respectively. No treatment differences in plasma glucose concentrations were identified. On day 28, rats receiving rosiglitazone and metformin had significantly lower plasma insulin concentrations (0.72 and 0.86±0.13 ng/mL, respectively) than did those of the control group (1.36±0.13 ng/mL, adj P<0.05), consistent with their established therapeutic action, although this did not equate to differences in blood glucose concentration. On day 56, plasma insulin concentrations converged among treatment groups, associated with higher plasma glucose concentrations (overall 56 day mean: 184.59 mg/dL, overall Δ=51.05 mg/dL, adj P<0.0001; Table 2). Figure 1 Pharmaceutical and nutraceutical effects on plasma insulin (A) and adiponectin (B) concentrations. Notes: Values are expressed as means ± pooled SEM; n=10 for all treatments except for control (n=11). Data points within the same day without common letters are significantly different (adjusted P<0.05) by repeated measures ANOVA, correcting for multiple comparisons. *Significant difference from day 0 values. On day 28, serum NEFA concentrations were significantly higher in the gemfibrozil treatment group than those in all other treatment groups (adj P≤0.0453 for all comparisons; Figure 2A). 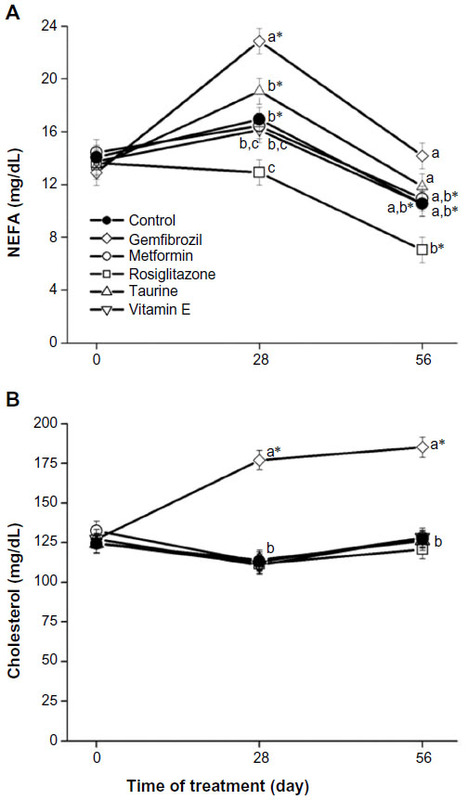 The rosiglitazone treatment group had significantly lower serum NEFA concentrations compared with those of the control (Δ=4.01 mg/dL, adj P=0.0272) and taurine treatment groups (Δ=6.15 mg/dL, adj P=0.0002) on day 28. On day 56, serum NEFA concentrations for the rosiglitazone treatment group were significantly lower than the serum NEFA concentrations for the gemfibrozil (Δ=7.11 mg/dL, adj P<0.0001) and taurine (Δ=4.79 mg/dL, adj P=0.0079) treatment groups, but not those of the control group. Figure 2 Pharmaceutical and nutraceutical effects on serum NEFA (A) and total cholesterol (B) concentrations. Abbreviations: NEFA, nonesterified fatty acid; ANOVA, analysis of variance; SEM, standard error of mean. Serum cholesterol concentrations are presented in Figure 2B. On days 28 and 56, serum cholesterol concentrations for rats receiving gemfibrozil were significantly higher than those for rats in all other treatment groups and those at day 0 (P<0.0001). On day 28, metformin and vitamin E groups had serum cholesterol concentrations that were significantly lower than those at day 0 (Δ=19.40 mg/dL, adj P=0.0149; Δ=16.23 mg/dL, adj P=0.0465, respectively). The rosiglitazone treatment group maintained consistent serum triacylglycerol concentrations on days 28 and 56 compared to day 0 (adj P≤0.27). However, aside from the metformin treatment group on day 56 (adj P=0.0616), all remaining treatment groups had higher serum triacylglycerol concentrations on days 28 and 56 (adj P≤0.0030) than those on day 0. Data are listed in Table 2. Growth curves are shown in Figure 3. There were no significant differences in body weight among treatment groups at day 0. The growth curves for all treatment groups are overall similar in shape, but with metformin-treated rats having the lowest growth trajectory (lower linear and shallower quadratic terms; Table 3) and rosiglitazone-treated rats having the highest growth trajectory (higher linear and steeper quadratic terms; Table 3). Figure 3 Pharmaceutical and nutraceutical effects on rat growth curves. Notes: Rats were weighed daily during the 56-day treatment period and the values are means; n=10 for all treatments except for control (n=11). The line of fit coefficients is listed in Table 3. Notes: Rats were weighed daily for 56 days, and the above regression equations were fit to those data. The intercept, linear, quadratic, and cubic parameter estimates were compared by ANOVA with block, choline, and treatment as fixed effects, correcting for multiple comparisons. Means in a column with superscripts without a common letter are significantly different, adjusted P<0.05. Average daily feed intake measurements between rats were not significantly different (data not shown). A main choline effect was present, with the daily feed intake of choline-deficient rats being 0.5 g/day higher than rats fed the standard diet (Δ=0.57 g, adj P<0.0001). This difference equates to less than 3% of the average daily feed intake. This paper provides a comprehensive assessment of the body composition, hepatic lipid characteristics, metabolic hormones, and blood metabolite effects of gemfibrozil, metformin, rosiglitazone, taurine, and vitamin E administration on a systemically healthy cohort of outbred rats. Overall, as hypothesized, the pharmaceuticals had effects in a healthy population similar to the reported effects in their target population, and the nutraceuticals had minimal effects on the measured physiologic parameters. A potential limitation to the comparison of longitudinal metabolic data in this study is the disparity in blood sample collection technique between days 0 and 28 versus day 56. The day 56 sample was taken during euthanasia as a methodological refinement to decrease animal stress. This difference in conditions surrounding blood collection may acutely affect some of the measured blood parameters on day 56, particularly plasma glucose and insulin, as observed in this study. On day 56, the observed hyperglycemia is classified as a physiologic hyperglycemia, consistent with a stress response to the euthanasia process which triggers release of catecholamines, promoting acute hepatic glycogenolysis and gluconeogenesis.18,19 This hyperglycemia results in compensatory insulin secretion, demonstrated by the convergence of plasma insulin concentrations on day 56 compared to day 28 in this study. However, this limitation does not affect interpretation of differences between treatment groups within a given day. Metformin is a biguanide effective in the treatment of type 2 diabetes mellitus, serving as an antihyperglycemic agent via reduction of hepatic gluconeogenesis, insulin sensitization of skeletal muscle, and anorexigenic properties.24 In this normoglycemic, nondiabetic rodent population, insulin sensitization was demonstrated by a plasma insulin concentration significantly lower than control rats. 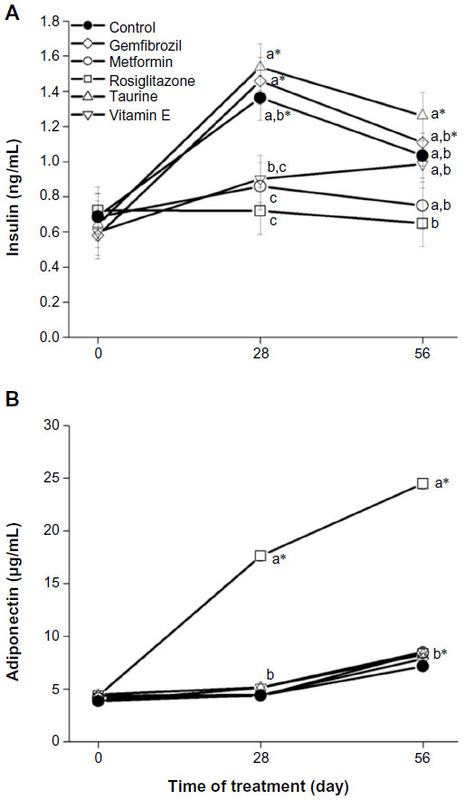 Although not mechanistically investigated in this work, this observation may be explained by the increased central and peripheral insulin receptor expression, activation, and signaling documented to occur with metformin therapy, reducing systemic insulin secretion for normal glucose homeostasis.25 Metformin-treated rats had the lowest growth trajectory, although body composition was similar to the control rats, and an anorexigenic effect was not elucidated as feed consumption was similar to all other rats. The thiazolidinedione, rosiglitazone, improves insulin sensitivity via binding to the peroxisome proliferator-activated receptor gamma, increasing plasma adiponectin concentrations, and decreasing hepatic lipid content.16 Significant increases in plasma adiponectin concentrations were documented in this study, and the rosiglitazone-treated rats had the lowest hepatic lipid and triacylglycerol concentrations, though not significantly different from the control rats. Unfavorably, rosiglitazone administration resulted in the highest growth trajectory, consistent with the 56% increase in carcass adiposity, a phenomenon hypothesized to be the result of its adipose depot-specific effects on lipid redistribution.26 Considering the comorbidities associated with obesity, this finding indicates that caution should be exercised with potential prescriptive off-label use of rosiglitazone. Taurine (2-aminoethanesulfonic acid) is an amino acid with a wide variety of physiologic effects, namely, muscle contraction, cell membrane stabilization, and neutralization of free radicals.27 No human tolerable upper intake level for taurine has been identified.28 Consistent with the absence of documented toxicity to date, of all the compounds evaluated in this study, taurine alone had no significant effect on any characteristic or parameter assessed in this cohort of healthy rats. As a common over-the-counter dietary supplement with presence in a variety of popular energy drinks, prophylactic doses of taurine similar to that used in this study may be encountered in the general population.29 Investigations into taurine supplementation for efficacy against a variety of common maladies, including heart disease, hepatic lipidosis, diabetes, inflammatory bowel disease, and others are on the rise, underscoring the importance of its null effects in a healthy population in this study. 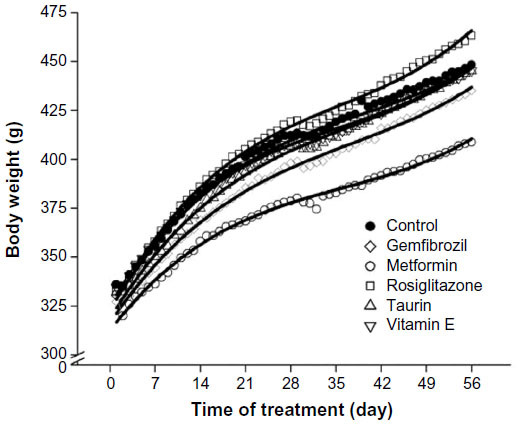 In a healthy cohort of adolescent, outbred rats, gemfibrozil, metformin, and rosiglitazone demonstrated physiologic effects predominantly consistent with their mechanisms of action, with rosiglitazone administration being the most detrimental. Taurine supplementation caused no adverse effects on evaluated parameters, and vitamin E supplementation resulted in modest hepatic triacylglycerol accumulation; the implications of this result warrant further investigation. This research was supported by the Iowa State University Center for Designing Foods to Improve Nutrition (CDFIN) through funds obtained from the United States Department of Agriculture. Appreciation is extended to Alyona Avdonina, Benjamin Noack, and Anthony Young of the Nutritional Physiology Laboratory in the Department of Animal Science at Iowa State University for their technical assistance with data collection and analyses. Beltrán-Sánchez H, Harhay MO, Harhay MM, McElligott S. Prevalence and trends of metabolic syndrome in the adult US population, 1999–2010. J Am Coll Cardiol. 2013;62(8):697–703. Bailey RL, Gahche JJ, Lentino CV, et al. Dietary supplement use in the United States, 2003–2006. J Nutr. 2011;141(2):261–266. Radley DC, Finkelstein SN, Stafford RS. Off-label prescribing among office-based physicians. Arch Intern Med. 2006;166(9):1021–1026. Yao ZM, Vance DE. The active synthesis of phosphatidylcholine is required for very low density lipoprotein secretion from rat hepatocytes. J Biol Chem. 1988;263(6):2998–3004. Kolovou GD, Mikhailidis DP, Kafaltis N, et al. The effect of alcohol and gemfibrozil co-administration in Wistar rats. In Vivo. 2004;18(1):49–53. Pari L, Ashokkumar N. Effect of N-benzoyl-d-phenylalanine, a new potential oral antidiabetic agent, in neonatal streptozotocin-induced diabetes in rats. Pharmacol Rep. 2005;57(4):498–503. Lessard SJ, Chen ZP, Watt MJ, et al. Chronic rosiglitazone treatment restores AMPKalpha2 activity in insulin-resistant rat skeletal muscle. Am J Physiol Endocrinol Metab. 2006;290(2):E251–E257. Cantafora A, Mantovani A, Masella R, Mechelli L, Alvaro D. Effect of taurine administration on liver lipids in guinea pig. Experientia. 1986;42(4):407–408. Oliveira CP, Gayotto LC, Tatai C, et al. Vitamin C and vitamin E in prevention of nonalcoholic fatty liver disease (NAFLD) in choline deficient diet fed rats. Nutr J. 2003;2:9. Ametaj BN, Bobe G, Lu Y, Young JW, Beitz DC. Effect of sample preparation, length of time, and sample size on quantification of total lipids from bovine liver. J Agric Food Chem. 2003;51(8):2105–2110. Carr TP, Andresen CJ, Rudel LL. Enzymatic determination of triglyceride, free cholesterol, and total cholesterol in tissue lipid extracts. Clin Biochem. 1993;26(1):39–42. Jacobs MB. Micro-Kjeldahl method for biologicals. J Am Pharm Assoc. 1951;40(3):151–153. Folch J, Lees M, Sloane Stanley GH. A simple method for the isolation and purification of total lipides from animal tissues. J Biol Chem. 1957;226(1):497–509. Westfall PH. Multiple testing of general contrasts using logical constraints and correlations. J Am Statist Assoc. 1997;92(437):299–306. Eskridge KM, Stevens EJ. Growth curve analysis of temperature-dependent phenology models. Agron J. 1987;79:291–297. Stein LL, Dong MH, Loomba R. Insulin sensitizers in nonalcoholic fatty liver disease and steatohepatitis: current status. Adv Ther. 2009;26(10):893–907. Obata Y, Yamada Y, Takahi Y, et al. Relationship between serum adiponectin levels and age in healthy subjects and patients with type 2 diabetes. Clin Endocrinol (Oxf). 2013;79(2):204–210. Traslavina RP, King EJ, Loar AS, et al. Euthanasia by CO(2) inhalation affects potassium levels in mice. J Am Assoc Lab Anim Sci. 2010;49(3):316–322. Artwohl J, Brown P, Corning B, Stein S. Report of the ACLAM task force on rodent euthanasia. J Am Assoc Lab Anim Sci. 2006;45(1):98–105. Staels B, Dallongeville J, Auwerx J, Schoonjans K, Leitersdorf E, Fruchart JC. Mechanism of action of fibrates on lipid and lipoprotein metabolism. Circulation. 1998;98(19):2088–2093. Krause BR, Barnett BC, Essenburg AD, et al. Opposite effects of bezafibrate and gemfibrozil in both normal and hypertriglyceridemic rats. Atherosclerosis. 1996;127(1):91–101. Horsmans Y, Desager JP, Harvengt C. Effects of gemfibrozil on the activities of plasma lipolytic enzymes in normolipidemic subjects. Clin Chim Acta. 1993;218(2):223–228. Macan M, Vrkic N, Vrdoljak AL, Radic B, Bradamante V. Effects of high sucrose diet, gemfibrozil, and their combination on plasma paraoxonase 1 activity and lipid levels in rats. Acta Biochim Pol. 2010; 57(3):321–326. Pernicova I, Korbonits M. Metformin – mode of action and clinical implications for diabetes and cancer. Nat Rev Endocrinol. 2014;10(3):143–156. Lee JO, Lee SK, Kim JH, et al. Metformin regulates glucose transporter 4 (GLUT4) translocation through AMP-activated protein kinase (AMPK)-mediated Cbl/CAP signaling in 3T3-L1 preadipocyte cells. J Biol Chem. 2012;287(53):44121–44129. Kang JG, Park CY, Ihm SH, et al. Mechanisms of adipose tissue redistribution with rosiglitazone treatment in various adipose depots. Metabolism. 2010;59(1):46–53. Huxtable RJ. Physiological actions of taurine. Physiol Rev. 1992;72(1):101–163. Shao A, Hathcock JN. Risk assessment for the amino acids taurine, L-glutamine and L-arginine. Regul Toxicol Pharmacol. 2008;50(3):376–399. Higgins JP, Tuttle TD, Higgins CL. Energy beverages: content and safety. Mayo Clin Proc. 2010;85(11):1033–1041. Institute of Medicine. Food and Nutrition Board. Dietary Reference Intakes for Vitamin C, Vitamin E, Selenium, and Carotenoids. Washington, DC: The National Academies Press; 2000:186–283. Roberts LJ 2nd, Oates JA, Linton MF, et al. The relationship between dose of vitamin E and suppression of oxidative stress in humans. Free Radic Biol Med. 2007;43(10):1388–1393. Jack Yang NY, Desai ID. Effect of high levels of dietary vitamin E on liver and plasma lipids and fat soluble vitamins in rats. J Nutr. 1977;107(8):1418–1426. Sklan D. Effect of high vitamin A or tocopherol intake on hepatic lipid metabolism and intestinal absorption and secretion of lipids and bile acids in the chick. Br J Nutr. 1983;50(2):409–416. Notes: aAll purified diets were supplied by Research Diets, Inc., New Brunswick, NJ, USA. bAddition of medium-chain triglyceride oil not included; base diet percentage only. cMineral mix S10026 contains the following (g/kg mineral mix): sodium chloride, 259; magnesium oxide, 41.9; magnesium sulfate, 257.6; ammonium molybdate tetrahydrate, 0.3; chromium potassium sulfate, 1.925; cupric carbonate, 1.05; ferric citrate, 21; manganese carbonate hydrate, 12.25; potassium iodate, 0.035; sodium fluoride, 0.2; sodium selenite, 0.035; zinc carbonate, 5.6; and sucrose, 399.1. dVitamin mix V10001 contains the following (g/kg vitamin mix): retinyl palmitate, 0.8; cholecalciferol, 1; all-rac-α-tocopherol acetate, 10; menadione sodium bisulfite, 0.08; biotin (1%), 2; cyanocobalamin (0.1%), 1; folic acid, 0.2; nicotinic acid, 3; calcium pantothenate, 1.6; pyridoxine-HCl, 0.7; riboflavin, 0.6; thiamin HCl, 0.6; and sucrose, 978.42. eMedium-chain triglyceride oil, SciFit, Tulsa, OK, USA. Notes: aNo significant interactions between diet and treatment were detected, so data presented here are marginal effects of diet pooled across treatment. Values are expressed as means ± pooled SEM (n); bP-values represent comparisons between the standard diet and choline-deficient diet, controlling for block, and not controlling for multiple comparisons. Abbreviation: SEM, standard error of mean.